This post talks about solutions to transfer data from hard drive a hard drive. If you want to move data from one hard disk to another quickly and safely, you can follow solutions here. Why do you want to transfer data from hard drive to another? It is well known that after April 8, 2014, technical assistance for Windows XP will no longer be available, and Microsoft Security Essentials for download on Windows XP will not be provided from then on. This is the time to consider updating to newer systeinm, say, Windows 7, 8 or 8.1. If your current computer can run these new systems, then you’ll have to considering purchasing a new one. Although, computers become quite affordable to most of us and are fairly less expensive than the average price of 10 years ago, we are still not willing to update system, change hard drive or build a new computer. The main reason, I guess, is that transferring data to new hard drive takes too much time and effort. Transferring data from hard drive to hard drive doesn’t mean simply copying or dragging files from the old hard drive to new hard drive, for that may miss important parts, such as boot sector and hidden partitions. The easiest way to transfer data from one hard drive is imaging or cloning disk with the help of PartitionGuru. Imaging and cloning are the most commonly used approaches of transferring data from hard drive to hard drive. Imaging backs up files on your hard drive to an image file from which the disk or partition can be restored, and the image file can be stored on any place you want, such as, external hard drive or USB flash drive. Cloning means copying data directly from one drive to another, which requires these two disks should be connected to computer at the same time. Eassos PartitionGuru Free will be your desired helper which is able to clone or image disk through three different modes and guarantees you can transfer data from one hard drive to another successfully and satisfies various needs. For instance, it provides three modes for cloning disk: copy all sectors, copy all valid sectors by the layout of file system and copy all files. How to transfer data from hard drive to hard drive? Step 1: Install and launch Eassos PartitionGuru Free. Then you can see all storage devices attached to your computer. Step 2: Click menu Tools and choose Clone Disk to open the disk cloning wizard. Step 3: Select source disk. Choose the disk you want to mirror and click OK button. Step 4: Select destination disk. Select target disk that will store cloned data and click OK button. Make sure you choose correct destination disk, or you’ll face data loss issue after the process. Step 5: Start to mirror the hard drive. 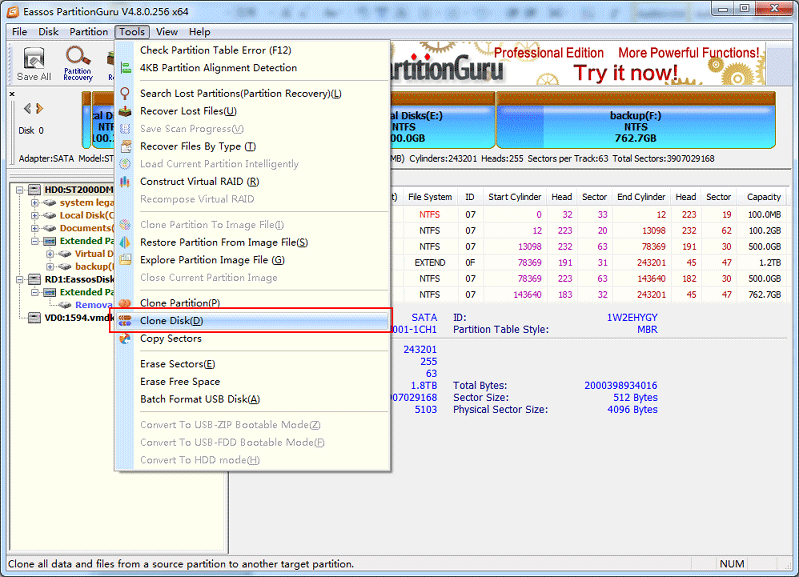 Click Start button and Eassos PartitionGuru Free starts mirroring the hard drive. The process may take long time if the disk is of large capacity. Do not close the software before the process is completed. This entry was posted in Partition Manager and tagged clone disk, copy disk, copy partition, hard drive cloning software, transfer data from hard drive to hard drive by EASSOS. Bookmark the permalink.